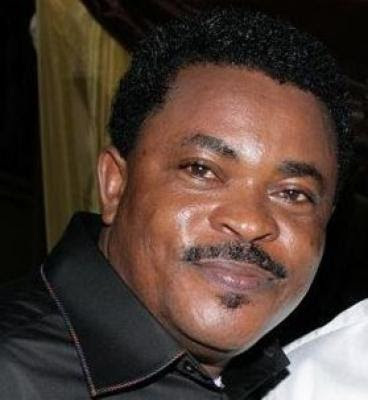 It will be remembered that when Victor Osuagwu, the popular Nigerian comic actor, got married, it was the talk of the city and the wedding images tended online for days. 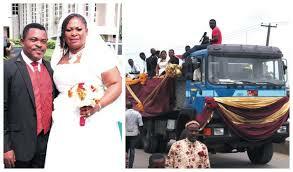 His wedding was not on the lips of many people because he is an artist; instead, the reason was that he did something strange; Thespian used a dump truck to transport his wife from the church to the reception instead of a car. In a recent conversation with Saturday Beats, he said it was a very satisfying thing to do. "I was very satisfied with the use of a dump truck as a wedding vehicle because that was my goal, I never thought of anything less than what happened that day, some people thought that the image was from a movie set, but a lot of people I knew it was my wedding. "It was a long trip to the reception and we caused a lot of traffic in the city, not that I did not have the good cars or did not have the money to rent lovely cars, but the people who know me know that I am a crazy animator and I wanted to show him to the world another part of me, "said Osuagwu. The actor said his decision to use the truck surprised his wife. He said: "I wanted to move TV entertainment to reality, my wife never knew I was going to do that, even Francis Duru, who was my godfather." When we left the church, people realized there was a truck Well decorated, but nobody knew what was going on. "People thought that the truck was there to transport goods until my wife told me that we should get into the car because her leg hurt because of the shoes she was wearing." When she asked which of the cars we should use, I pointed to the truck. Surprised and it was one of the biggest shakes of her life. "Francis Duru overheard what I said to my wife and had to ask the same question and I told him it was the truck my wife and I were going to ride in. I told everyone to enter all the available SUVs, but We would arrive at the reception in the dump truck, everything my wife said was, 'This is going to be great, but how could I get on it?' the vehicle was not an ordinary truck, but a double truck, the biggest one.When we got to the truck, people brought a ladder for her to get on the truck. " Osuagwu, who was recently introduced as the brand's ambassador for HelpApp Limited, said he was charming by the gesture. He said: "I am honored that they have chosen me as their brand ambassador and it means that the company means well to all my followers, family and admirers.They believe that with me on board, people will know about their product. would help eradicate water pollution, "he said.